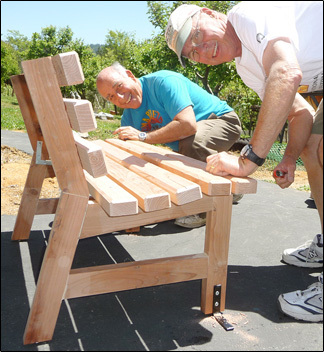 On May 20th, 6 of us traveled up to Harry Schoenfeld's shop in the Santa Cruz Mountains and assembled 4 new benches for the green. After a lovely lunch in the garden we were all "dragged" kicking & screaming down to Harry's state of the art shop and each given specific jobs to do.Harry & Steve had cut and put together the side supports already but left a fair amount of ripping & beveling of the seat slats for us to do. Many hands made short work of this project in a little over 2 hours.